At the NAMM, EVH has introduced a 1-watt micro amp: the 5150 III Micro Stack. Blackstar introduces a new generation of ultra-compact guitar amps that can also serve as speakers for computer, tablets and smartphones. Roland introduces the new EX version of its Cube Street portable guitar amp at Musikmesse 2014. Vox will launch this summer the G2 generation of Mini3 ultra compact modeling amps for guitar, available in three distinctive finishes. Chinese guitar accessories manufacturer Aroma Music Co. introduces at Musikmesse the AG-03M mini amplifier. Roland recently introduced its new Mobile AC acoustic amp and Mobile BA battery-powered stereo amp. Quilter Labs expands the MicroPro 200 family with a new 10-inch amplifier model, a 12-inch model and a head. The T.A.N.K. 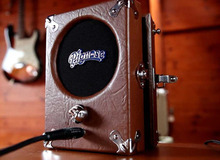 is a mobile guitar amplifier.